J. writes What has Arctic Ice got to do with the European Union? J. writes Today in Brexitland – what now? RESOLVED to achieve the strengthening and the convergence of their economies and to establish an economic and monetary union.. RESOLVED to implement a common foreign and security policy including the progressive framing of a common defence policy.. The Treaties begin with these clear statements of the intention to form a single nation, what the founding fathers of the union called "The United States of Europe". Those who support the EU outside the UK are openly working towards a single Nation. They are EU Nationalists. The EU Nationalists in the UK never admit that the EU project is about building a new Nation. The process of transferring control to the EU has been relentless. Since the Lisbon Treaty EU policy is set by majority voting (QMV) in most areas and there are few vetoes available. The Lisbon Treaty allowed the European Council to remove almost any of the vetoes that remain if there is a unanimous vote to do so. There is now no need to have a further Treaty to implement the full union of the EU Nation State. The fact that no further treaties are needed for full EU Union explains why the EU Nationalists in the UK Parliament voted to allow a referendum if the treaties were changed. A country cannot have two governments responsible for the same areas of control, the real government is the organisation that delegates control to regional governments, councils etc. Having delegated that control it can take it back as desired. Since Lisbon the EU controls large areas of the government of the UK. The EU has delegated control over many areas to National Governments so that there is no abrupt transition to full EU government. See EU Control for the details of which areas of government are controlled by the EU. Those who support the EU within the UK have developed a debating technique where they demand that those who point out that the EU is a project to create a single state must explain what they understand to be the nature of sovereignty, independence, statehood etc. This is a disingenuous technique to deflect the discussion from the obvious truth and to lure the unwary into yet another small step towards an EU Nation. Anyone who desires the independence of the UK is a fool to be lured in to such nonsense. 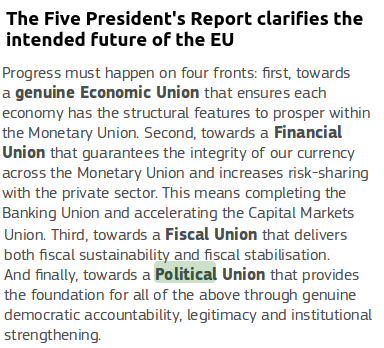 As recently as 2015 the Five President's Report made it clear that political union was the goal of the EU. If the EU Referendum is overturned the EU Nationalists will have won. The UK will subside into a small region of the EU, the UK government will assume that it has a mandate to finish the job of creating a full United States of Europe and will aid the Germans to achieve this. Once the UK is in the Eurozone and the EU has its own army there will be no escape. The EU will swing to the far right and become a militant force in global politics exerting its control over North Africa and confronting Russia. This was always the objective of a United Europe in the minds of its founders (See for instance The Pan European Manifesto). The ordinary British who supported the EU Nationalists should have studied what they were adoring. EU Nationalists control the UK Parliament. If they succeed in overturning the Referendum then that Parliament will become little more than a regional government within 20 years. Voting for EU Nationalist MPs is pointless because their intention is to give up control, to relinquish the power to make a difference for their constituents and the people of the UK. Footnote 1: EU Nationalists are racists who believe that Europe will be "safest" when all diversity is removed. At present this is the cultural and economic diversity of nation states but with the rise of the far right in the EU it will end up in naked racism against ethnic groups. Footnote 2: The British have been poor students of the EU. Most do not realize that the EU is about power, not love, peace and internships abroad. Most importantly the British seem entirely unaware that the European Movement (the EU Nationalist organisation) created the Bilderberg Group to provide funds and support. The Bilderberg Group is immensely powerful, being composed of huge multinational corporations, and its members have provided the funds, media support and propaganda for the EU Nationalist cause in the UK. See Who is paying for Remain and the Peoples Vote?.